Meet #2 of the 2010 Indoor Track & Field Developmental Series is this Saturday March 13 at MUN Field House from 6pm-9pm. REGISTER ONLINE by 10:00pm Friday and note that 2010 NLAA Road Running Members DO NOT need a Track & Field membership to take part in either the 1500m or the 3000m. 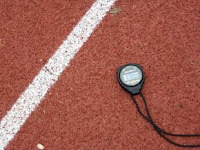 The NLAA encourages all road running members to take part in distance track events.